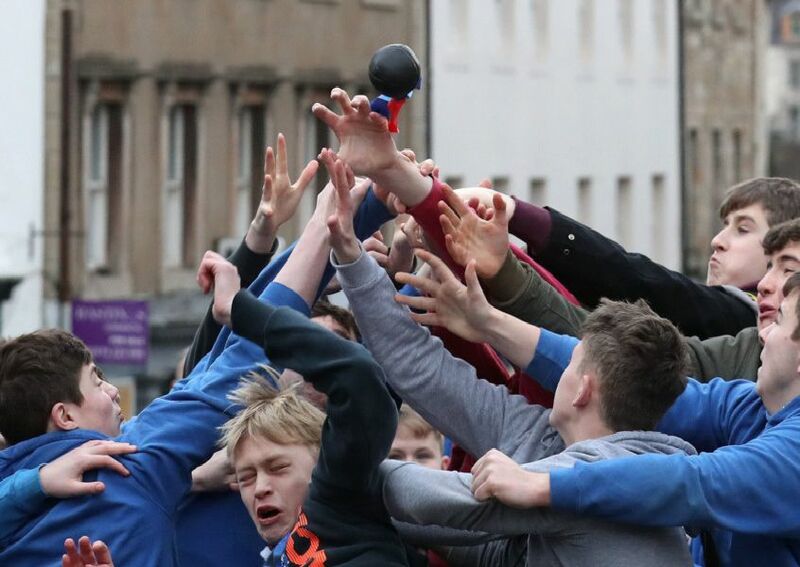 THE youths of Jedburgh were running hell for leather today as one of Scotland’s oldest annual events, Fastern’s E’en Hand Ba’, got under way in the town centre. The annual game, which can trace its origins back to the 1700s, involves two teams, the Uppies (residents from the higher part of the town) and the Doonies (those from the lower part) getting the ball - which is said to represent the head of an Englishman - to either the top or bottom of the town. The ball, which is made of leather, stuffed with straw and decorated with ribbons representing hair, is thrown into the crowd to begin the game. Shops are boarded up ahead of the annual 'Fastern's E'en Hand Ba' event on Jedburgh's High Street. Boys chase the leather ball up the hill past cars during the annual 'Fastern's E'en Hand Ba' event. Over a dozen different balls are used throughout the day. Around 100 turned up to take part in the men's match, which takes place every year.